e-publishing maze. Unfortunately, they’re only marginally successful. The first half of this book deals in the generalities of e-publishing–the basic e-book types, the roots of e-publishing, its benefits, digital rights management, etc. While all these topics may be necessary to understanding digital publishing, they do little to help the novice get started. For instance, the authors devote a whole page and half out of 278 pages to "The Nuts and Bolts of Writing an e-Book." When all is said and done, the writing process is the same, but it’s how the writing appears on the page that may be different. While there are lots of chapters–49 to be exact–none are longer than eight pages, giving very little detail in each one. This book contains more information on the history of computing than on actually publishing e-books. In defense of the authors’ target readership, most beginning writers may not know too much about computing. In fact, many experienced writers don’t, either. 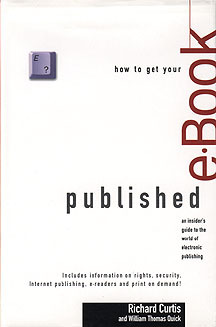 However, the title of this book is "How to Get Your e-Book Published." Curtis and Quick devote several chapters to working with established e-book publishers, including print-on-demand and vanity publishers. But there’s nothing in these sections that hasn’t been said before about traditional print publishing. The most valuable section of this book is the last one on marketing an e-book. This seems to be where the greatest difference exists between traditional and digital publishing. Let’s face it, an e-book author may find it hard to conduct a book signing at his or her favorite book store. But the Internet poses challenges that Curtis and Quick not only point out but help provide solutions. Frankly, even the last and best segment on marketing isn’t enough to make this book a worthwhile purchase.